A broad range of fuel cell technologies is being developed for stationary applications. The potential for widespread adoption in the transportation sector rests on the great promise that polymer electrolyte membrane (PEM) fuel cells hold for low-cost mass production, among other factors. The automotive industry has highly evolved management and manufacturing expertise, enabling low-cost mass production of sophisticated technologies and efficient marketing of the products. This industry's involvement suggests that PEM technology may have profound implications for other sectors, such as the industrial or buildings sector that routinely pay power capacity costs an order of magnitude higher than those common for vehicular prime movers. 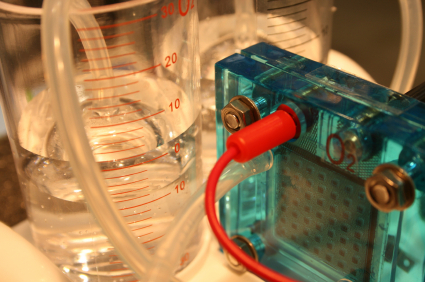 Fuel cell developers are focusing on both stationary and transportation applications. The relative pace of commercial development in the different sectors is as yet unclear. Moreover, synergies may exist between the stationary and mobile fuel cell markets, and it is possible that commercialization can be best accelerated through a cross-sectoral approach. Acceptable cost thresholds are higher in stationary applications, but automotive companies have expertise in very sophisticated cost control for volume production. The two sectors do not typically collaborate on product development, let alone marketing. There is a need to examine the circumstances under which coordination among these businesses can be helpful and ways for it to be facilitated. By analyzing likely early adopters and strategic niche applications, and the various barriers that must be overcome in each market, we can recommend approaches that either help build particular markets, or exploit synergies where they make sense. In all cases, careful examination of both sides of the market (supply and demand) must be made, since progress will be made only when defensible business cases can be built that match customer demand with suppliers' ability to deliver. At present, the private sector does not value the environmental benefits of fuel cells. However, there are likely to be growing private market needs that can help boost the technology's prospects and complement environmental drivers. For example, some current regulations unintentionally create barriers to the entry of fuel cells into stationary, distributed power applications. These regulatory barriers must be clearly articulated for government to take the steps that are needed to remove them. Among these barriers are environmental regulations that do not credit efficiency or environmental cleanliness. It falls to the public sector to advocate valuation of these benefits through appropriate policy measures. These measures may include incentives, such as tax credits, or more market-based mechanisms, such as pollution credit trading schemes.